A 37-year-old man who had been alcoholic for 15 years presented to our hospital with complaints of abdominal pain in epigastric region for 3 months and melena for 2 days. The pain was of moderate intensity, radiating to the back, aggravated by food and relieved by vomiting. There was no past history of epistaxis, diabetes, hypertension, blood transfusion or any surgery. No family history of similar pain, gastrointestinal bleeding, mucocutaneous telangiectasia or epistaxis was noted. On physical examination, the patient had epigastric tenderness but no hepato-splenomegaly, ascites, jaundice or mucocutaneous telangiectasia. His laboratory investigations revealed haemoglobin level of 4.2gm%, serum amylase-299 and serum lipase-132. Upper-gastrointestinal endoscopy was normal. 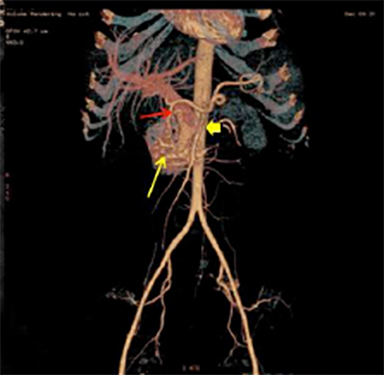 Computed tomography (CT) of the abdomen revealed multiple vessels in and around the head and uncinate process of the pancreas with feeding arteries from gastroduodenal artery (GDA) and superior mesenteric artery (SMA),early filling of superior mesenteric and portal veins and dense pancreatic stain in arterial phase (Figure 1). CT also revealed partial thrombus in the portal vein (Figure 2). 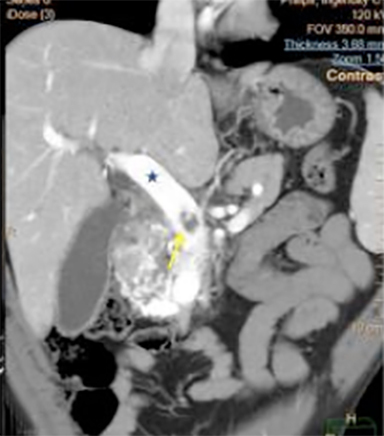 CT findings were suggestive of arteriovenous malformation (AVM) of the pancreas. 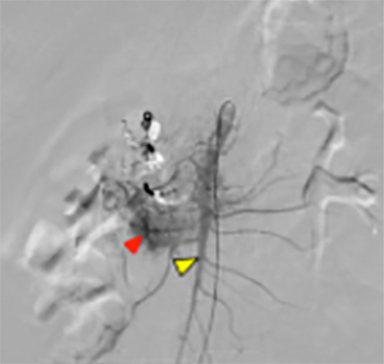 The celiac axis angiogram revealed dilated tortuous arteries, dense stain in the pancreatic head region and early filling of the veins (Figure 3A). Arterial feeders from GDA were embolized with gelfoam and coils. 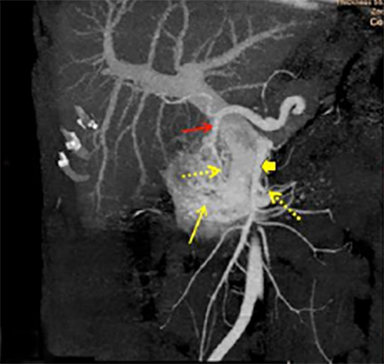 Post-embolization angiography showed neither a dense stainin the pancreas nor early filling of the veins (Figure 3B). 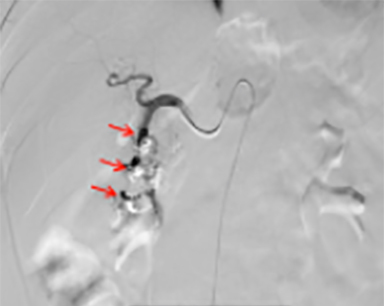 Thereafter an SMA angiogram showed dilated tortuous feeding arteries and dense stain in the same region which could not be embolized (Figure 3C). The patient continued to have abdominal pain and bleeding that required multiple blood transfusions. The patient was taken for a laparotomy, which revealed bulky head of pancreas and multiple vessels around the head and uncinate process of pancreas. A Whipple’s pancreaticoduodenectomy was performed. 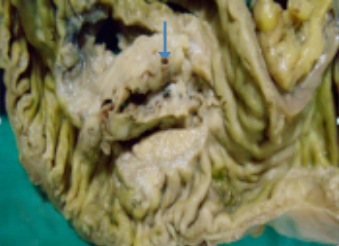 The histopathological findings were suggestive of arteriovenous malformation of head and uncinate process of pancreas (Figure 4A-C). The differential diagnoses for pancreatic arteriovenous malformation are neuroendocrine tumors, hypervascular metastases, and intrapancreatic accessory spleen. 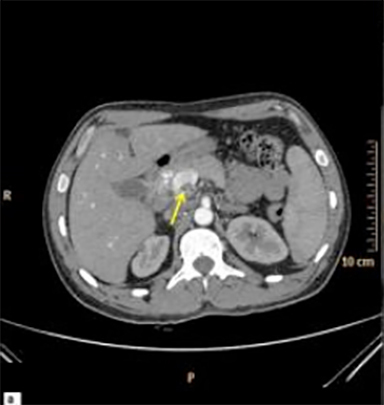 The pancreatic arteriovenous malformation is a rare cause of gastrointestinal bleeding or abdominal pain and may lead to complications like portal hypertension, portal vein thrombosis and pancreatitis. CT is the primary imaging modality used to confirm the diagnosis and to help in treatment planning. Surgery is the only definitive treatment of pancreatic AVM. Halpern M, Turner AF, Citron BP. Hereditary hemorrhagic telangiectasia. An angiographic study of abdominal visceral angiodysplasias associated with gastrointestinal hemorrhage. Radiology. 1968;90:1143-1149. Nishiyama R, Kawanishi Y, Mitsuhashi H, et al. Management of pancreatic arteriovenous malformation. J Hepatobiliary Pancreat Surg. 2000;7:438–442. Butte JM, San Francisco IF, Pacheco F, Solar A, Crovari FJ, Jarufe NP. Arteriovenous malformation of the pancreas: Report of a case. Surg Today. 2007;37:604–607. Takemoto I, Tsuda M, Yano Y, et al. Pancreatic arteriovenous malformation combined with portal thrombosis. Intern Med. 2007;46:233-236. Kanno A, Satoh K, Kimura K, et al. 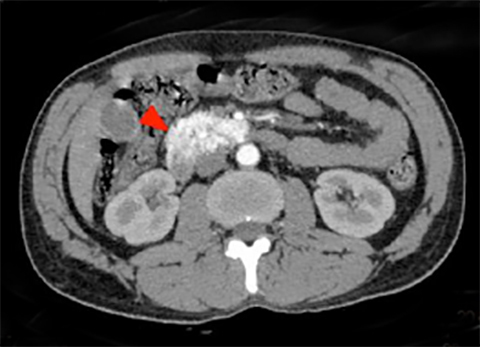 Acute pancreatitis due to pancreatic arteriovenous malformation: 2 case reports and review of the literature. Pancreas. 2006;32:422-425. Jenssen HL, Wijnhoud A, Haagsma EB, et al. 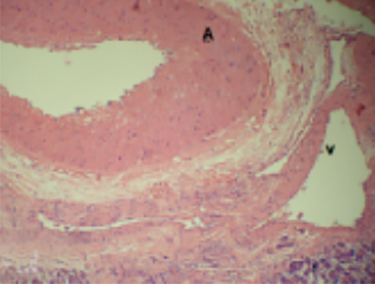 Extrahepatic portal vein thrombosi: Aetiology and determinants of survival. Gut. 2001;49:720-724. Bayraktar Y, Harmanci O. Etiology and consequences of thrombosis in abdominal vessels. World J Gastroenterol. 2006;12: 1165-1174. Koito K, Namieno T, Nagakawa T, Ichimura T, Hirokawa N, Mukaiya M, et al. 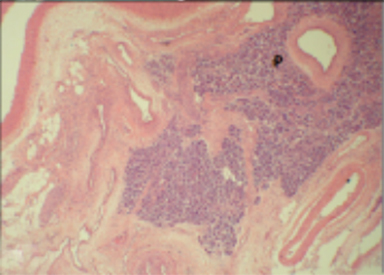 Congenital arteriovenous malformation of the pancreas: its diagnostic features on images. Pancreas. 2001; 22: 267-273. Endo K, Sata N, Shimura K, Yasuda Y. Pancreatic arteriovenous malformation: A case report of hemodynamic and three dimensional morphological analysis using multi-detector row computed tomography and post-processing methods. J Pancreas.2009;10:59-63. 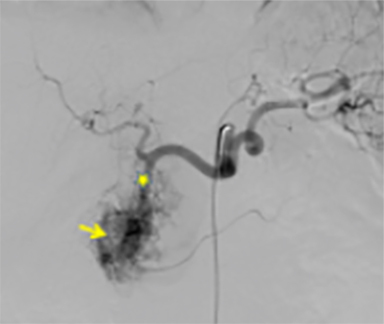 Chuang VP, Pulmano CM, Walter JF, Cho KJ: Angiography of pancreatic arteriovenous malformation. Am J Roentgenol. 1977; 129:1015-1018. Radiological Case: Arteriovenous malformation of the pancreas. Appl Radiol. Prepared by Dr. Rawat, Dr. Buxi, Dr. Yadav, Dr. Singh Ghuman, and Dr. Agarwal while practicing at Sir Ganga Ram Hospital, Rajinder Nagar, New Delhi, India.